The Register is hearing that HPC bods SGI have bought the assets of the failed unified file/block access and hybrid array startup Starboard Storage, which crashed and burned in October. Some Starboard employees are now back at work and the product line technology is set to continue. Their CEO is Jorge Titinger, who was recruited in February 2012 to replace Mark Barrenechea, whose reign ended in 2011. Titinger said in August this year that SGI's focus is on commercial HPC, Hadoop-style big data systems and the storage systems underlying them. Previous SGI storage-related acquisitions include FileTek for its StorHouse data management and file virtualisation in October 2013, and crashed Copan for its MAID spin-down disk array technology in February 2010. StorHouse has big data relevance but Starboard doesn't seem to have had that focus. In September SGI presented at a Deutsche Bank event and said more about its strategic plan. The company confirmed that its ideas for the future revolved around HPC, big data and storage, with an intent to grow this part of its business 15 per cent in fiscal 2014 to $560m revenue. The pitch made the point that inactive data is left on primary storage and consumes (i.e. wastes) it. Eighty five per cent of primary storage data is inactive, it added, citing Forrester Research. 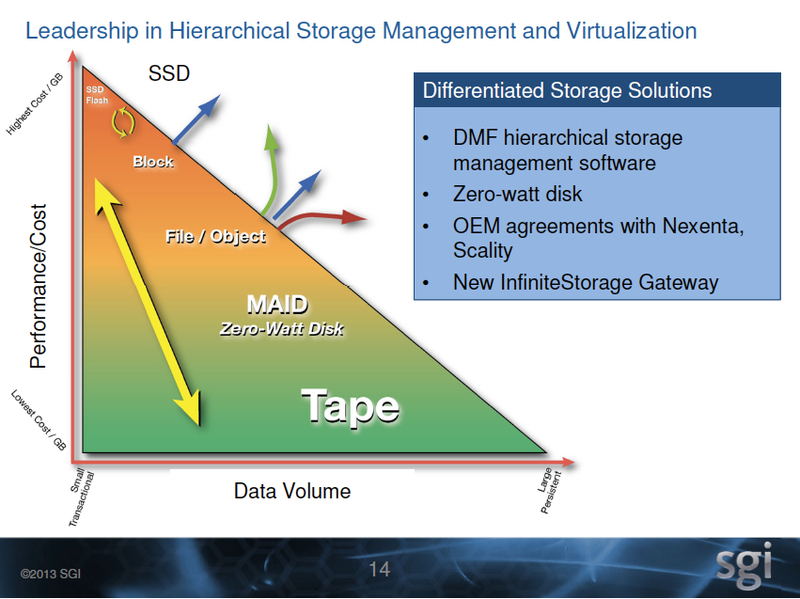 SGI's storage thinking. Click the chart to get bigger image. From the chart it looks as if the Starboard hybrid array technology could slot in as flash-accelerated file and block storage below its Modular InfiniteStorage HPC arrays, and perhaps becoming a variant in that product line. Another perhaps is that maybe – just maybe – the acquired Starboard tech will enable SGI to stop using NetApp E-Series controllers in its arrays, giving it control over its controller tech destiny and saving money currently heading to Sunnyvale. We've asked SGI for comment on what we have heard and got nowhere, a spokesperson saying: "SGI does not comment on rumours or speculation regarding decisions, products, promotions or acquisitions that have not been officially announced."